One of the best ways of explaining how CX works is by giving real life examples of customer experience excellence. We have found genuine customer stories and shared insights into how these bring to life the Six Pillars in our CX framework. The Six Pillars are based on creating emotional connections with customers and include Personalisation, Integrity, Empathy, Time & Effort, Expectations and Resolution. Renewing car insurance can be extremely frustrating with customers feeling duty bound to shop around to get a better deal. ‘Muireann’, an Aviva customer, had been calling around to compare prices. When she called Aviva to discuss her renewal, the customer service agent blew her away. The Aviva agent noticed Muireann’s name and began speaking to her in Irish. Thinking it was just a little small talk, she threw out a few Irish phrases but the agent continued talking about her car insurance. She was a little embarrassed at first, not having spoken Irish regularly since school and was worried it wouldn’t be good enough to continue an insurance renewal call ‘As Gaeilge’. The agent was extremely patient and more than willing to prompt her with any words she didn’t know and eventually they were able to complete the call speaking Irish. The feeling of joy and pride when she completed the call hit the roof. This was a task that Muireann never expected to enjoy and it left her with a big smile on her face. Muireann has since gone out of her way to talk to friends and family about the experience and is writing to Aviva to thank the amazing customer service agent for the experience he gave her. Insight: The insurance sector remained at the bottom of the rankings in this year’s CXi report. This sector’s continued focus on acquisition at the peril of retention gives it one of the highest churn rates. Stories like this however, show that Aviva are genuinely investing in the right staff and are focussed on bucking the trend. What a great example of combining Personalisation and Empathy. We’ve all seen the comments field when ordering food online. Usually it’s to tell the restaurant to add extra ketchup, or to let the delivery person know to phone on arrival as the doorbell is broken. One customer of Belfast fish and chip shop ‘Feeley’s’ had a very unusual request on her online order. The chipper on the Shaws Road in West Belfast was surprised when an order marked ASAP came in on December 30 – complete with a request to pick up some flu medicine en route and send it along with the food. In fact it seems the customer wasn’t even hungry. All she wanted was a box of cold and flu medicine and was too sick to go to her local pharmacy to pick it up. The Feeley’s deliveryman kindly obliged and picked up the medicine. The customer then commented on Feeley’s Facebook and thanked them for helping her out in her hour of need. This is a remarkable example of a business going above and beyond to exceed their customer’s Expectations. Insight: Customers have needs and they also have expectations about how these needs will be delivered. Customer satisfaction is the difference between Expectation and actual delivery. Understanding, delivering and, if possible, exceeding expectations is a key skill of great organisations. “John” was looking forward to celebrating being able to chew again after a root canal treatment by visiting a local restaurant with his wife. Things didn’t turn out quite as they expected!.They had a long wait after arriving and were eventually seated at the bar beside a noisy blender used for crushing ice – not the best start. Their waiter Bob then hurriedly took their drink orders without asking if they wanted food, which they did. Eventually they did get their food orders taken but the sides ended up being brought out before the meal and one of their orders was wrong. Bob the waiter admitted he was in the wrong and apologised. The rest of their meal arrived shortly after and it was an otherwise pleasant experience… until the bill arrived. 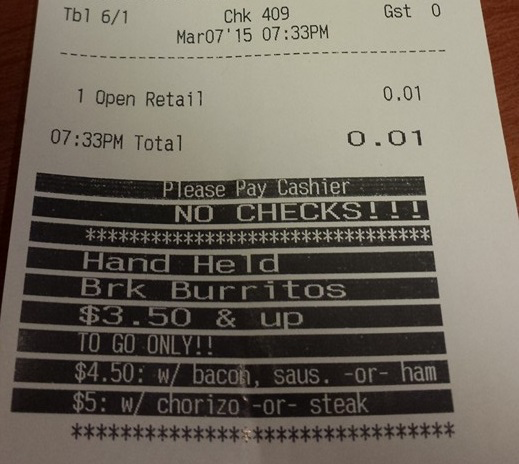 The couple noticed that the price for their full meal and drinks came to one cent. Assuming this was another mistake they showed Bob the bill and asked him how much they needed to pay. But Bob told them there was no mistake and instead apologised for the poor experience they received, Delighted, the couple tipped Bob $20.00 and then spent the trip home trying to figure out what % tip they gave him, realising it was 200,000%! Insight: Discounts are so often used as last-ditch attempts to salvage a terrible experience that we sometimes forget how powerful they can be in turning a poor experience into a great one. Restaurateur Danny Meyer, whose restaurants have consistently beaten the odds in a very rough industry, talks about hospitality in terms of good vs. great. With a ‘good’ experience things may go fine. You may get everything you wanted precisely the way you ordered it. But it’s rare for an employee to make you feel special, like they’re on your side. That’s what Bob did here by recognising that his customer’s weren’t having their expected experience and gave them a powerful dollop of Resolution delivered brilliantly. A customer service agent named Jill worked for an online clothes retailer called ‘Jack Threads’. Jill managed to turn a regular online customer service interaction into a ‘Remark-able’ customer experience and turned the customer into an advocate in the process. Insight: Jack Threads empower their staff to resolve issues by making their own decisions. With this freedom Jill was able to resolve her customers issue quickly and hassle free. She was also able to create a personal connection with the customer which isn’t always easy to do, particularly online. Being able to do this is a proven way to create loyal customers who wouldn’t hesitate to sell on your businesses behalf. Adding an authentic personality is a great empowerment strategy and pays off in spades. It’s always nice to see ‘Remark-able’ experience recognised by a happy customer. In this heart-warming story, a service agent, ‘Jessica’, helped the query of an older customer, ‘Sharon’. Sharon called in because her laptop wasn’t working. Having recently suffered two strokes, Sharon explained that she was struggling with writing, and was forced to call in. Jessica initially explained to Sharon that customers normally send in faulty items for inspection and repairs. Sharon grew teary over the news, explaining that she was dependent on the laptop to communicate with her daughter who lived miles away in Hawaii. Knowing that red tape shouldn’t stop her from taking care of a customer in need, Jessica quickly exchanged the laptop for her (sending her a new one), and even spent the extra time helping her set up the old passwords and account names, in addition to re-downloading Skype so she could talk with her family. What really makes this a great story, however, is the follow-up. Out of the blue a few months later, our heroic service agent was called down to reception. 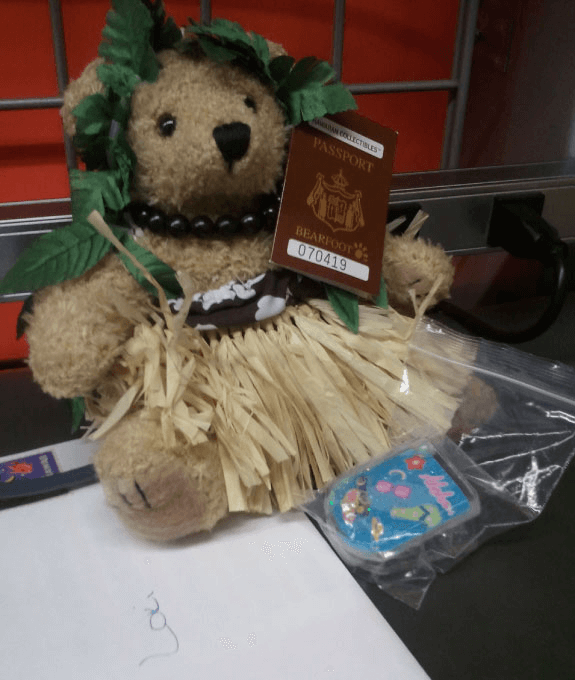 To her surprise, waiting there was Sharon, holding a card and a teddy bear with a hula skirt. Jessica was overjoyed saying: “Sharon told me that what I did meant so much to her and her family that she called our corporate office and told them what I did. Her daughter even sent up a thank you card and bear from Hawaii and Sharon insisted on hand delivering it”. Insight: The Empathy Pillar is measured by a business’s understanding of their customer’s needs. Delivering on this pillar is key to establishing strong relationships with your customers. In this case the Time & Effort pillar was also employed by removing unnecessary hurdles in doing business with the company. We are always looking for examples of CX Excellence. If you have any yourself please send it on to us and we will feature it in our blog. If you would like to explore how your company can activate CX excellence, e-mail Michael Killeen to discuss further.